A great idea for the “green” gift giver in you! 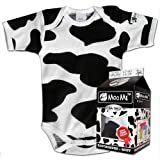 These adorable cow print bodysuits are 100% organic cotton and packaged in mini milk cartons. A fun and creative way to show someone you care!